Co-browsing is the advance feature of ProProfs Chat, which has fully customized web page viewing capability that enables live chat support operators to remotely access the web page of your website on which site visitors visited during a chat session resulting in higher levels of customer satisfaction. 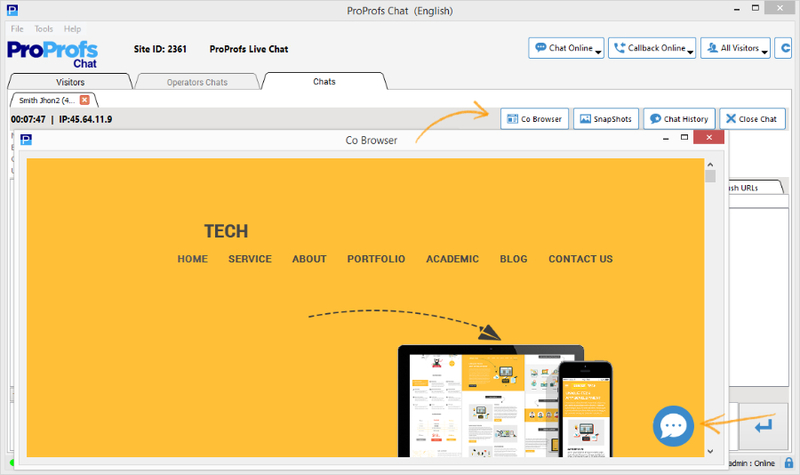 ProProfs Chat provides a dynamic co-browsing option for chat operators. In the specific context of live chat software, co-browsing permits support operators to view the web page of your website on which site visitors visited during a chat session. This feature is activated by clicking the appropriate icon in ProProfs operator chat window. Co-browsing enables chat operators to directly access the page being visited on website by site visitors. The moment a site visitor clicks a new page, the screen view available to the chat operator attending to the site visitor changes instantly. Chat operators can not only direct customers to specific web pages on the website and view these pages simultaneously, but also explain them to customers in real time through live chat. When a chat session is going on, the operator can click on Co-browsing button available in operator chat window to see the visitor’s page which opens in a new window. The page will change at the operator end as the visitor clicks on another page. With Co-browsing, Chat operators can not only direct customers to specific web pages on the website and view these pages simultaneously, but also explain them to customers in real time through live chat. This feature can go a long way in making it possible for chat operators to further explain specific products and services displayed on their websites. It also comes as a valuable asset to analyze technical diagrams, schematics and other graphical representations of specific products presented on the company’s website.